As this was just a short trip for us and we were arriving and leaving by train, we stayed at a standard Chinese hotel near the train station. There are plenty of other places to stay in the town or near some of the attractions. If you have more than one day we suggest seeking out those places as the area around the train station is mostly construction sites and it’s very dusty. Our Chinese friend helped us book a place, as there are very limited options on English language websites. If visiting during peak flower time, you can expect rooms to be a bit hard to come by and more expensive than at other times. 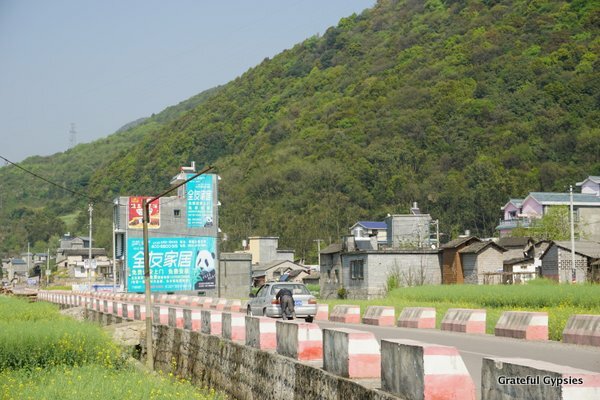 You can see the flowers literally everywhere around Luoping, but there are three view points that come highly recommended: Hundred Thousand Hills (Shiwandashan, 十万大山), Golden Rooster Hills (Jinji Lin, 金鸡岭） and Snail Farms (Luositian, 螺蛳田 at Niujie 牛街). Unfortunately, we went a little late for the flowers. Most websites tell you that you can see the flowers until June. That is most certainly not true. It depends on the temperature; the warmer it is the faster they go away and the longer the winter temperatures stick around the longer the flowers stay. This year it got warm pretty early so there weren’t many flowers left when we were there in the second week of March. We went to the Snail Farms because our driver thought it would have the most flowers left. Not 10 minutes into our drive, and his old hunk of junk car broke down on the side of the road. Thankfully, we were stranded in an area that still had quite a few flowers in bloom. Eventually homeboy’s brother came, they pushed the troubled car to the side, and we got in little bro’s ride instead. Once the vehicle switch had been made, we finally got to the Snail Farms viewpoint. Although it was mostly green, the view was totally worth it. Despite the repeated claims of our driver that the landscape is “terrible” and “ugly” without the flowers, we quite enjoyed it. Plus, it was nice to not have to fight crowds of camera wielding tourists that descend upon the town when the flowers are at their peak. Can you see all nine dragons? Go to the bus station near the train station, pass right by the ticket windows and head straight for the buses (you pay the driver directly once on the bus). There aren’t many foreigners traveling through Luoping so they will likely know where you want to go and point you in the right direction. If not, just show them the characters above. Unfortunately we didn’t make it here on our trip because of our short time, but it is an option if you’ve got an extra day or are super motivated. 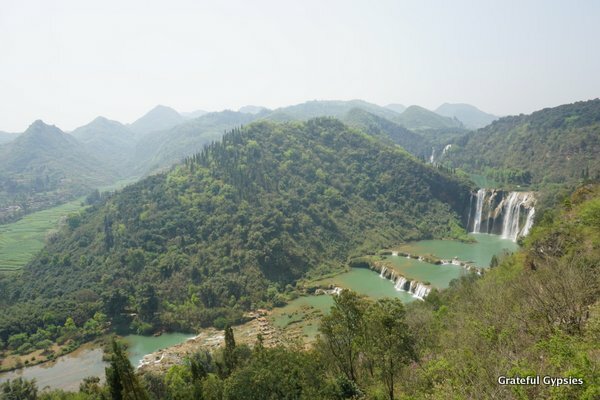 Most websites say that it is a scenic spot catered towards Chinese tourists (which usually means it’s best avoided), but it is possible to walk along the river outside of the park and visit some Yi minority villages. They have a weekly market plus there are some small guest houses in the villages. Reflecting on a nice, short trip. 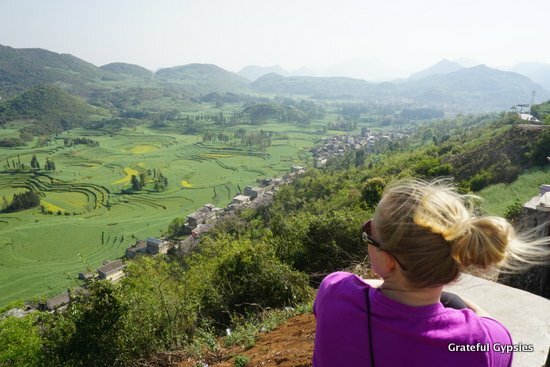 For people like us living in Yunnan’s capital of Kunming, places like Luoping remind us why we live here. Sure the city isn’t really anything special, but it’s pretty awesome that beautiful scenic spots like this are just a few-hour train ride away. 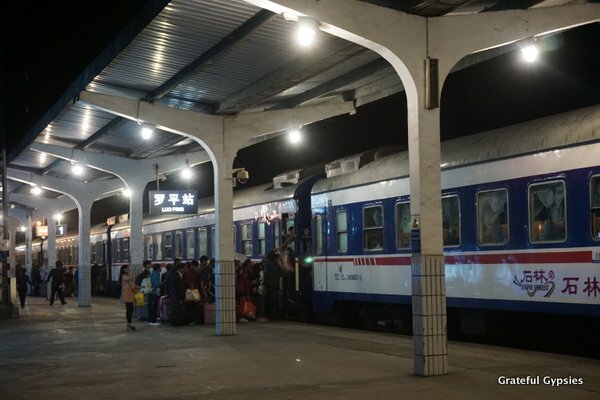 If you’re just backpacking in Yunnan, we’d still consider making Luoping a stop, especially if you’re coming from or going to Guizhou.